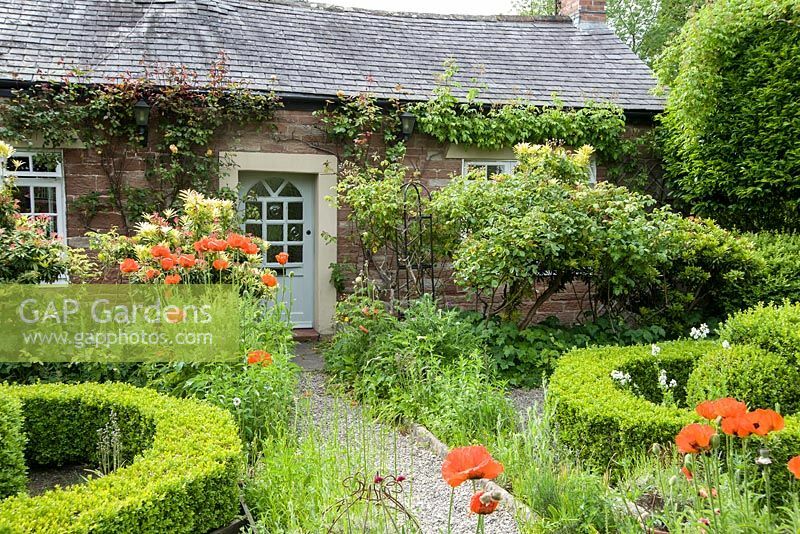 Pretty cottage garden of artist Debbie Jenkins and her partner Jason Thompson in the quiet village of Hayton, near Brampton in Cumbria. Under an acre in size the garden feels larger as it wraps around the single storey cottage in a sequence of distinct spaces with winding paths. It even has a small stream running through it, lined with moisture loving plants. There is a box parterre in the front garden framed with scarlet poppies in June though naturalism is the watchword elsewhere with long grass, lots of seating areas, topiary and multiple metal sculptures and decorative plant supports made by Jason featuring poppy seedheads, roses and small birds. Debbie's studio is in one corner of the garden and the two disciplines, art and gardening, feed each other. A creative, relaxed garden full of charming detail.